A large commercial building had just finished an elevator equipment upgrade - but they hadn't been able to bring the elevator back into normal operation. For some reason, whenever the emergency power generator was called on to supply energy, its protection circuit breaker would trip. The upgrade was intended to bring the original DC elevator up to a state-of-the-art system, with better elevator control, operation, energy efficiency, reduced maintenance costs, and tenant satisfaction. Despite all the efforts some problems were still unresolved.The emergency power generator protection circuit breaker problem started during tests of the emergency system. The first thing facilities did was bring both the installing contractor and elevator equipment manufacturer back in, but none of their suggestions had any affect. The contractor suggested increasing the circuit breaker trip settings. That didn't work, and the facilities manager wasn't willing to increase the settings any further. If a building power emergency occurred now, the elevator system wouldn't operate! The manager asked his own team to conduct a power quality survey of the whole elevator emergency electrical distribution system and pinpoint the problem once and for all. 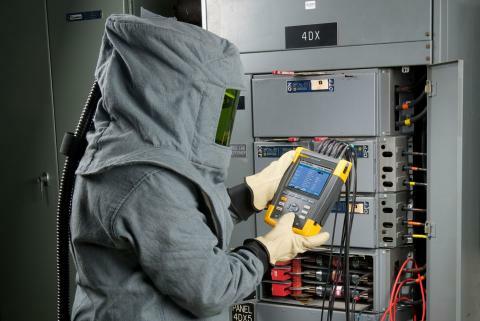 Facilities used a three-phase Power Quality Analyzer to examine the elevator system's operating characteristics during an emergency power system test. First, they connected the analyzer to the circuit and used the setup function to make sure all the connections were accurate. Then, they selected the volts/Amps/Hertz feature from the menu. 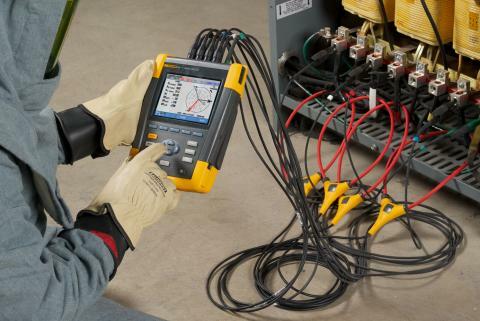 The power quality analyzer immediately began recording voltage and current on all three phases. Then, one technician conducted a generator test. As predicted, the breaker tripped. Looking at the trended Volts/ Amps/Hertz data, the technicians could see where the breaker tripped, but they didn't see any event data that would have caused it. This problem was too fast for regular readings.The team switched to the analyzer's Transients function, so they could see transients as fast as 5 microseconds, started recording and conducted the generator test. When the breaker tripped this time, a transient was clearly evident. In modern power systems, transients are present all the time, some small and some large. Switching of inductive loads, lightning strikes and transmission system switching can all generate huge voltage spikes. These transient voltage spikes last as long as 100 microseconds and can be extremely dangerous. 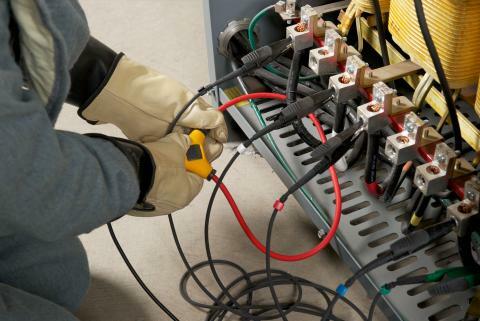 More commonly, when an inductive load such as a motor or a transformer is switched on or off, it generates a voltage spike sometimes called a "kickback spike." Given the layout of this particular system, facilities suspected a startup-inrush current of some kind was causing the breaker trip. 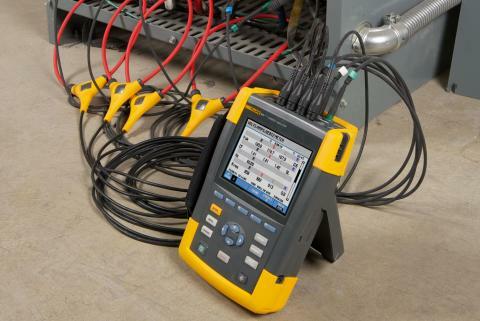 They selected the Inrush Currents function on the analyzer and reviewed the current levels for all the loads managed by the emergency power system. The technicians did see an inrush event. The inrush magnitude was within the equipment specifications ...but why was the inrush event occurring when the system was already operational? For some reason, the elevator system wasn't sensing the power fault condition. So, every time emergency power was reapplied, the elevator system started to perform a normal start-up - and that much inrush and start-up current on top of normal operations exceeded the rating of the power emergency protection circuit breaker. A simple adjustment to the elevator power fault sensing circuit allowed the new system to properly perform the individual elevator car power failure procedure. In the process, facilities verified the protection circuit breaker settings and adjusted them back to the proper set points. Given our tendency to get jobs done as fast as possible, some testing procedures can easily get overlooked. Even if new or upgraded equipment appears to perform basic operations, it doesn't elimate the need for comprehensive acceptance testing. If the original installers had performed the emergency system test themselves, they would have spotted the problem sooner and had a much happier customer.